We do not make network listings available upon request. However, you can use the online locator to find all The UPS Store locations in a city, province, and postal code. How do I apply for a job with UPS®? How do I search for jobs at The UPS Store locations? All The UPS Store locations are independently owned and operated. Contact your neighbourhood location directly to learn about individual The UPS Store job opportunities. Can I purchase moving supplies at The UPS Store? The UPS Store offers moving boxes and kits in a variety of sizes and all the necessary supplies, including tape, bubble cushioning and packaging peanuts – everything needed for a smooth and easy move. We can even make custom boxes for odd-shaped items. Plus, we can help you decide on how many boxes to use and which packaging materials will work best. How much do you charge for moving supplies? Yes. Many of our locations are capable of shipping large or odd-shaped items, such as furniture. Large or odd-shaped items often require specialized packaging. The UPS Store offers custom handling and packaging, from blanket wrap to custom cartons, crating, shrink-wrapping and palletizing. Your neighbourhood location can advise you on the best packing method for your item(s). Contact your neighbourhood location to ensure it offers packing and shipping of large or odd-shaped items. Will you pick up my items at my location and pack and ship them? Several of our locations are capable of coming to your residence or business to pick up, pack and ship your item(s). Because our locations are individually owned and operated, services and prices may vary. Contact your neighbourhood location to ensure it offers this service. How can I find a location that offers the Pack & Ship Guarantee? Call ahead and ask any centre associate if that location offers the Pack & Ship Guarantee. What do I need to do to have my packages protected by the Pack & Ship Guarantee? Just take your item to a participating location and let The UPS Store Certified Packing Experts® handle the rest. We will professionally pack and ship your item via UPS®. You should know the value of your item to enjoy this program. Does the Pack & Ship Guarantee cost extra? Yes. The centre associates will be able to tell you the costs for your particular shipments. If you believe your package is lost, please contact the location that shipped your package so that a tracking system search can be conducted. You’ll need to provide your receipt in the event of a claim, so please keep it. If your package was damaged in transit, please contact the location that shipped your package to report the damage. You’ll need to have your shipping receipt available, so please keep it. The recipient must retain the box and all packaging materials along with the item until you have received instructions from the centre or the claims adjuster. Yes. Our locations are also approved drop-off locations for UPS® shipments. To drop off your package at The UPS Store, visit your neighbourhood location and speak with our shipping experts. Delivery time depends on the service you purchase. Contact your neighbourhood The UPS Store location for days and hours of operation. For a list of shipping holidays, contact the package carrier directly. Use the online tracking feature to track your shipment. You will need your tracking number. If you don’t have the tracking number, contact The UPS Store location that shipped your item(s). Because our locations are individually owned and operated, The UPS Store Canada Home Office does not have access to your shipping details. If you did not ship your item(s) at The UPS Store, contact the package carrier directly to obtain your tracking number. If the information on the online tracking feature is unclear, contact the carrier directly to inquire about specific delivery details of your shipment. Yes. To receive e-mail notifications, use the online tracking feature. Before tracking your package, you have the option of entering up to three e-mail addresses and a short message (optional). When the package is delivered, e-mail notifications will be sent to all specified e-mail addresses with a link to the most current package information. No. Once your shipment leaves The UPS Store location, you may not upgrade the service level. Each carrier offers a declared value program. Because our locations are individually owned and operated, prices may vary. Contact your neighbourhood location for declared value pricing. If you are the sender, immediately notify The UPS Store location that shipped your item(s) to report a damaged shipment and begin the claim process. Have the recipient save all packaging material. Once The UPS Store location reports the damaged package, the carrier that shipped your package will initiate an investigation and may or may not approve the claim upon successful completion of the investigation. If you are the recipient, contact the sender of the shipment to inform him or her that the shipment arrived damaged. Because the sender is the customer of The UPS Store, he or she will need to notify The UPS Store location that shipped the item(s) to report a damaged shipment and begin the claim process. Remember to save all packaging material. If you are the sender, immediately notify The UPS Store location that shipped your item(s) to report the lost or stolen shipment and begin the claim process. Once The UPS Store location reports the lost or stolen package, the carrier that shipped your item(s) will initiate an investigation and may or may not approve the claim upon successful completion of the investigation. If you are the recipient, contact the sender of the shipment to inform him or her that the shipment is lost or stolen. Because the sender is the customer of The UPS Store, he or she will need to notify The UPS Store location from which the item was shipped to report the lost or stolen shipment and begin the claim process. If you are the sender, immediately notify The UPS Store location that shipped the item(s) to report the late arrival of your shipment. If you are the recipient, contact the sender of the shipment. Because the sender is the customer of The UPS Store, he or she must immediately notify The UPS Store location that shipped the item(s). Contact your neighbourhood location to ensure it offers this service for details on duties, taxes and fees. Yes. You can receive e-mail notifications of your shipment’s progress or status. This can be set up at The UPS Store through which you are shipping your package. Delivery time depends on the service you purchase. The UPS Store offers various delivery options for several carriers. Contact The UPS Store location that shipped your item(s). Because our locations are individually owned and operated, The UPS Store Canada office does not have access to your shipping details. If you did not ship your item(s) at The UPS Store, contact the package carrier directly. If you are the recipient, contact the sender of the shipment to inform him or her that the shipment is lost or stolen. Because the sender is the customer of The UPS Store, he or she will need to notify The UPS Store location that shipped the item(s) to report the lost or stolen shipment and begin the claim process. Who do I contact if I have a question about my international shipment? Contact The UPS Store location that shipped your item(s). Have the carrier’s tracking number, the Parcel Shipping Order (PSO) number and any other relevant information on hand. Printing services includes printing, copying as well as finishing services for your documents such as collating, binding options, tabbing, laminating & more. The UPS Store offers a wide variety of printing and finishing services, including electronic file access (e.g., e-mails, CDs, USB drives), colour and black-and-white digital printing, black-and-white copies, binding, collating and laminating. Because all our locations are individually owned and operated, services may vary. Contact your neighbourhood location to find out available services. You can pick up your print job at The UPS Store, or the printing services professionals at The UPS Store can ship it where you need it or deliver it to you. Because all our locations are individually owned and operated, document delivery service may vary. Contact your neighbourhood location to ensure it offers this service. Some of our locations have an experienced graphic designer on staff to assist with the design of your print job. Contact your neighbourhood location to ensure it offers graphic design assistance. Some of our locations have the capability to capture your hardcopy documents and convert them to digital format. Contact your neighbourhood location to ensure it offers this service. The UPS Store can handle Microsoft® Word, Excel®, PowerPoint® and Publisher files, as well as Adobe PDF files and much more. PDF will provide the best opportunity to meet quality and colour expectations for a document. Contact your neighbourhood location to find out which file types they can accept. Our locations can receive files by e-mail, CD and USB or flash drives. Contact your neighbourhood location to find out the best way to send your file to the location. Job completion times will vary depending on the complexity of the job. However, our goal is to have the job completed no later than 72 hours from the time we start the job. Contact your neighbourhood location to get a job quote and estimated time of completion. 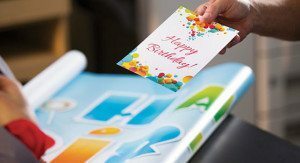 The UPS Store handles a wide variety of print jobs, including business cards, presentations, newsletters, flyers and much more. Contact your neighbourhood location for available services. The UPS Store offers various mailboxes sizes. Contact your neighbourhood location today to find out what’s available. Contact your neighbourhood location to discuss the steps to opening a mailbox. You will need to provide two valid forms of identification, one of which must include a photograph. The mailbox service agreement is an agreement between The UPS Store location and the primary box holder for the duration you receive mail at that location. Contact your neighbourhood location for more information on getting started. Because all our locations are individually owned and operated, prices may vary. Contact your neighbourhood location for pricing. All The UPS Store locations offer mailbox services. Contact your neighbourhood location for more details. Because all our locations are individually owned and operated, the minimum length of agreements may vary. Contact your neighbourhood location for more details. Your local The UPS Store associate can help you determine the size of mailbox best suited for your needs. Contact your neighbourhood location for specific information on opening a mailbox. What happens if I receive more mail than will fit in my mailbox? If you expect a continued increase in the volume of mail you receive, you may wish to upgrade to a larger mailbox better suited for your needs. Contact your neighbourhood location to find out which options are currently available. Can I transfer my agreement to another The UPS Store location if I relocate? Because each location is individually owned and operated, transfer policies may vary. Contact your neighbourhood location for more details. I'm moving to a different area. Can I open a mailbox before arriving at my new location? You can add the names of individuals authorized to receive mail at your mailbox. Each recipient will need to provide two valid forms of identification in order to complete some additional paperwork. Can other people pick up mail at my mailbox? Yes. The UPS Store offers Canadian postal stamps. The UPS Store House Account program offers frequent customers and small businesses personalized service and a complete portfolio of products and services in one convenient location. When you become a house account customer, you receive monthly billing for easy expense tracking, group authorization so designated individuals can do business at The UPS Store on your behalf, and a one-stop shop for your packaging and document services needs. How do I know if I should open a house account? Contact your neighbourhood location to find out if opening a house account is right for you. Can you create custom rubber stamps? The UPS Store offers high-quality custom stamps in a variety of sizes and styles, including self-inking models. Contact your neighbourhood The UPS Store location to complete the order form for your custom rubber stamp. May I get multiple Corporate Cards with the same card number? This makes cardholder accountability difficult. Most companies issue cards on an individual cardholder basis. How do I obtain a CRS Corporate Card? To find out more about the CRS Corporate Card program, fill out the CRS Business Application to have someone contact you. What is an Alternate Delivery Location (ADL)? The ADL program is designed for companies that have a mobile workforce or technicians that need to receive packages while they are out in the field. It provides flexibility on where to send and receive shipments and packages. A shipment may be directed to a designated The UPS Store location rather than to the recipient’s primary residence or place of business. The recipient can then pick up the package at a time that is convenient. With the ADL solution, what happens if end-users don’t pick up their packages? Packages will remain at The UPS Store for a specified amount of time. When that time has expired, the packages will be shipped back to their originating locations or pre-determined destinations. Can customers pick up ADL packages after the account-specified time frame? If the program has additional days available with a storage fee, then the package can be held for those additional days. If the package is not picked up by the end of those additional days, the package will be returned to its originating location or pre-determined destination. If the program does not have additional days available, the package will be returned. Can ADL end-users have their packages re-directed to their homes? For security purposes, customers are not able to re-direct their shipments to another address. Once delivery is directed to The UPS Store, the shipment cannot be intercepted and re-directed to a different location. How can I become part of the ADL program? To find out more about the ADL program, contact your UPS account representative or fill out the CRS Business Application to have someone contact you. What is your Returns program? The Returns program provides customers and/or employees of companies a convenient way to return items or merchandise to the company via The UPS Store. Companies have the option of having all shipping and/or packaging charges billed to them or to have the end-user pay for the service. With the Returns solution, is it better to have The UPS Store employee pack my parcel rather than my customer or employee? Our locations are professionally trained in shipping carriers’ packaging guidelines. This includes speciality packaging materials and techniques for a variety of items, including electronics. Whether or not you have The UPS Store location package your item(s) may depend on the value and fragility of the item(s) and the company’s shipping arrangements. How can I become part of the Returns program? To find out more about the Returns program, fill out the CRS Business Application to have someone contact you. The Exchange program allows The UPS Store to fulfill the role of exchanging merchandise, parts or other items. When an item needs to be returned and replaced, The UPS Store can facilitate the exchange, saving the company valuable time. How can I become part of the CRS Exchange Program? To find out more about the CRS Exchange Program, fill out the CRS Business Application to have someone contact you. The UPS Store can help speed a company’s business transactions by offering its employees and/or customers access to business services such as copying, faxing, printing, mailbox services, packaging, shipping and other related products and services. Companies utilize this program to facilitate communications with customers by using our network as a nationwide business services provider. Can I obtain or purchase a list of your franchised locations? We do not make network listings available upon request. However, we will assist you in finding The UPS Store locations that will best fit your needs. We are looking for a temporary solution. Is the Corporate Retail Solutions program right for us? Our programs are intended to be long-term, ongoing programs that require contractual agreements. These frequently asked questions provide preliminary information to companies that may be interested in opportunities to host non-traditional The UPS Store locations. If you are interested in exploring The UPS Store franchising opportunities, please visit the Franchising Opportunities page. Business travelers can enjoy the convenience of having a full-service business centre onsite. An onsite business centre can provide a solution for emergency situations like last-minute reprinting of presentation documents. Guests are likely already comfortable with The UPS Store brand and can trust that their print jobs will be handled effectively. Convention and meeting planners can submit their documents through the online print portal to have them produced on site, saving the time and cost required to ship documents to and from the meeting venue. Guests can have access to the packing and shipping expertise of The UPS Store within your location. What can a The UPS Store centre do for my campus? The UPS Store can provide retail services as well as customized integrated services, such as student mailroom management and campus print solutions that allow your students and staff to focus on higher education. Who will operate The UPS Store On-campus? The UPS Store university locations are operated by experienced, multi-centre franchisee/business owners. These franchisees are motivated to provide world class customer service to the students, faculty and staff. What are the features of adding a The UPS Store to my location? Adding a The UPS Store centre can help to provide your customers valued business services and convenience. Adding a The UPS Store centre to your self storage facility can help differentiate you by increasing resources for your customers. Will I need to add extra staff for my The UPS Store? • In business for a minimum of six months. • Minimum average sales of $7,000 per month. • Canadian owner who is a Canadian citizen or permanent resident. With a loan, you agree to an interest rate and a ﬁxed daily amount payment based on that rate and the loan size. You can choose to repay in 9 or 12 month (186 or 248 equal payments). There is no collateral requirement for our loans. How much do you charge for a loan? We charge an interest rate for loans paid through ﬁxed daily payments. You have the option to repay in 9 or 12 months (186 or 248 equal payments). Is collateral required for your loan? No, we do not request any collateral. Our interest rate varies by customer and situation. Please apply online to see how much you qualify for and at what rates. How do you determine how much financing I am eligible to receive? We determine the amount you qualify for based on information from the data sources you connect. For example, we can take your processor’s deposits, Paypal and Square transactions, or your cheque deposits and cash deposits into consideration. If I don’t process debit and credit card sales can I still apply for financing? Yes. We will determine the amount you qualify for based on your bank statements and any other data sources like Paypal and Square transactions that you are able to provide from the last 12 months. If I don’t have an email address can I still apply online? I just opened my business; am I still eligible to receive financing? If your business is at least six months old, you can apply for financing. I am planning to move my business to a new location; can I still apply for financing? Yes, but please inform us of your planned move when you apply. I just moved locations; am I still eligible to receive funding? Yes. As long as your business has been operational for the past six months, you can apply for ﬁnancing. Can I still apply for funding if my business is up for sale? Unfortunately, we cannot move forward with your application if your business is currently for sale. However, this does not mean that you can’t receive ﬁnancing from us in the future, once your business is no longer for sale. Do you finance all types of businesses? We fund businesses in nearly every industry, including restaurants, retail, auto repair, and beauty salons. We do not fund start-ups that have no revenue. We work with existing small- to medium-sized businesses across Canada in a variety of industries, including restaurants, retail, auto repair, and health and beauty. I don’t own 100% of my business; can I still apply for financing? If you own at least 75%, you can apply alone. If you own less than 75%, your co-owner(s) information is also required. How much of the business do I need to own in order to apply? We require a minimum of 75% ownership on ﬁle. Do I have to submit my SIN during the online application? No, you do not have to submit your SIN in order to apply online. Who can I submit as an emergency contact on my application? Anyone that is not an owner of the business can be listed as an emergency contact. How does having more than one credit/debit card terminal affect my application? This will not affect your application; simply indicate how many terminals you have at your business location on your application. What qualifies as a government ID? Any valid ID issued by a Canadian government agency is considered government ID (e.g., driver’s license, passport, or permanent resident card). What happens after I apply for financing? Once we’ve received your application, we will send you an email conﬁrmation with instructions or someone will contact you within 24 hours. If you have any questions, you can also contact one of our Customer Success Agents at 1-866-682-9604 during regular business hours: 9:00 am-6:30 pm EST, Monday to Friday. It takes approximately 10 minutes to complete your online application. 1. Make sure all contract pages are signed and dated where necessary. 2. Send clear documentation; submit a photo via text if that is easier. 3. Submit all requested documentation with the initial contract. How will I know that I have been approved for financing? You will receive an email conﬁrmation outlining your approval from Thinking Capital. How quickly can I expect to receive financing? Upon approval, you can expect to receive your funds in as little as 24 hours. Are there restrictions on what I can use the financing for? You can use the funds for anything related to your business, such as driving growth through renovations, inventory, expansion, equipment marketing and advertising. 1. Signed and dated contract pages. 4. Data Release Form (if a payment processor is connected). To qualify for ﬁnancing, a number of factors are considered. Additional documentation may be required, depending on how much ﬁnancing you need. Applying for ﬁnancing will not affect your credit score. Can I apply for financing for multiple businesses and locations? Yes. We will work with you to minimize the documentation required and to make the application process as simple as possible. My business is experiencing a slow season. Can I still apply for financing? Yes. We understand that your business may have a high and low season. We consider the last 12 months of your history in making our decision. What is a Data Release Form (DRF)? A data release form provides us with permission to receive your monthly and daily batch outs from your processor. We have developed a safe and secure way to obtain this data from your processor. A merchant identiﬁcation number is provided to you by your processor. It is unique to your company and is linked to your terminal. How do I know if I have the correct Merchant Identification Number (MID)? Do I need to change my current processor if I accept financing from The UPS Store Small Business Loans powered by Thinking Capital program? We have developed relationships with many processors, reducing the need for our customers to change processors once approved for ﬁnancing. However, there are cases where a customer may need to change their current processor to one that we work with. If this is the case, we will help facilitate the transition during your application. If you have any questions, you can contact one of our Customer Success Agents at 1-866-682-9604 during regular business hours: 9:00 am-6:30 pm EST, Monday to Friday. How will I receive my financing? During the application process, you will be requested to provide your business bank account information (a void cheque). Once your application has been approved, we will send your funds via wire transfer to the bank account obtained from your void cheque. How long will it take for the funds to appear in my bank account, once you send the wire transfer? Depending on the bank you work with, you may see your funds as early as the same day. Payments are automatically deducted from the business bank account that you provided during your application. I no longer have an outstanding balance; can I apply for more financing? Yes. You can re-apply online or contact one of our Customer Success Agents at 1-866-682-9604 during regular business hours: 9:00 am-6:30 pm EST, Monday to Friday. Can I make additional payments to my account? during regular business hours: 9:00 am-6:30 pm EST, Monday to Friday. Who can I contact for more information regarding Staples Business Loans powered by Thinking Capital? What if my Merchant Identification Number (MID) changes while I have an outstanding balance? 9:00 am-6:30 pm EST, Monday to Friday. Where can I locate information about my account? Account located on our website. Use the log in you created when you applied for funding. How can I access my Customer Account? Click on the “Log in” button at the top of our www.thinkingcapital.ca website and enter your customer log in credentials. If you do not remember your customer portal password, click on the “Forgot Password?” link. You and every additional owner who has signed the contract will receive a copy by email. 9:00 am-6:30 pm EST, Monday to Friday to arrange for a copy to be resent to you. How can I find out the current outstanding balance is on my account? Success Agents at 1-866-682-9604 during regular business hours: 9:00 am-6:30 pm EST, Monday to Friday. How do I access my account statement? Your statements can be located under “Statements” in the “My Account” section when you log into your Customer Account. What information is available on my statement? Yes. Log into your Customer Account and print the statement you need. Essentially you will need to create an API signature to connect your PayPal account. 1. Log into your PayPal business account at www.paypal.com. Click the proﬁle icon ( ) at the top right side of the page. 2. From the Business Profile menu, select Profile and Settings. 3. Proceed to the left side of the menu; click My Selling Tools. 4. Go to the Selling Online section; click the Update link for the API Access item. 5. To generate the API Signature, click Request API Credentials on the API Access page. 6. Select Request API signature and click Agree and Submit to generate the API signature.